OK that title was a stretch, but the latest news is that we need more bricks. About 60 or so more...so when the weather breaks I'm off to my favorite brick pile. I do feel a little like "Gopher" I guess as I go for more bricks. Did you know Gopher's given name was "Burl Smith"? Me either...who cares? After a pretty relaxing Memorial Day weekend (which included a trip to the budget-threatened Brandywine Battlefield in the true spirit of the holiday), it's back to work on the house today. Before we get into the chimney project, there's another side project going on at the Amstel & Dutch Houses currently - painting the outbuildings. You'll remember that both buildings just received new roofs, so now its time to paint them. The Dutch House outbuilding (a recreated smokehouse) is getting painted on the outside only, while the Amstel House garden house is getting painted both outside and inside (excluding the ceiling inside which has a nice peeling whitewash look to it that was so in vogue in the 1990s - "shabby chic" or something like that). We received a grant from the National Society of the Colonial Dames of America in the State of Delaware (who henceforth shall be known as "the Dames" - its OK, "Dames" is politically correct speech for the organization - I worked for them in Maryland for several years) for the paint project. It's great because the Dames originally paid for the construction Dutch House smokehouse way back in 1939. So last week I pulled down our garden exhibit in the Amstel garden house, cleaned out the cabinet and vacuumed up all the spiderwebs. The painters actually started on Friday and are finishing up today and Wednesday. We decided to paint the Amstel garden house white again on the inside walls and exterior woodwork. We considered painting the exterior woodwork the same historic color as the Amstel House exterior (discovered through paint analysis) but since the garden house is a 1930s colonial revival reconstruction, we decided to leave it white. That will help to visually differentiate it from the main house, and keep that lovely white trim that they were so fond of during the colonial revival. The Dutch House outbuilding is being painted the same color as the Dutch House (red) which is the same color that it already is. To clean them, the masons dip a nylon brush (on a handle) into the acid solution and scrub the bricks which are arranged in a row on the ground. BTW - Don't do this near any plants that you want to keep alive. Once they are scrubbed, they may require a little more scraping. If so, a final acid wash happens again, then they all get hosed off. Repeat for all sides. Let them dry and they are ready to use. One issue with this cleaning process that most people don't realize...once the historic bricks are clean, they look like they did in the 18th century - i.e. brand new. They don't look like the brick on the house that has 200 years of grime, mildew, etc. on it. After the chimney is completed, the cleanup process requires some more acid washing, so the mortar joints will look pretty clean too. They will both take some time to weather to a matching patina (Don't you either love or hate that word - patina - thanks alot Antiques Roadshow!). Luckily, the house is at a stop sign on a busy street, so there will be plenty of exhaust to help darken up our new brick, and the chimney is shaded by a tree which will promote mildew (did I say "luckily"?). One thing we decided against is that we don't want to artifically age the brick or the mortar to match right away. Gentlemen, we can rebuild it. We have the technology. Today, the masons started rebuilding the chimney. 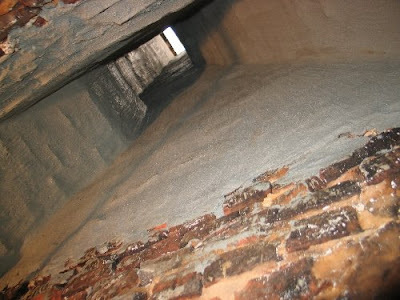 The flue for the second floor fireplace was reconstructed along its original path (which had been altered in a previous rebuild of the chimney). They had to parge the flue as they went. If they rebuilt all the way then tried to parge the flue, they might not be able to reach all the way down inside the flue. Sure...it sounds obvious... but its one of those things that I can see myself doing wrong if I was attempting something like this on my own. As they rebuilt the chimney the areas that previously were voids are instead solid masonry construction now. Rafters that had been "free wheelin'" near the chimney now tie in to a header that rests on the masonry of the exterior wall. Once they brought both flues to essentially the same height, they parged the exterior of the chimney. Remember the earlier post when I promised gory details....well, here comes the math part (I promise it's not hard...maybe boring...but not hard!). To insure that the fireplaces don't smoke the flue needs to be sized correctly. A rule of thumb is that the area of the flue opening should be about 10% of the area of the fireplace opening (from my sophomore geometry class I remember that area = length x width). If the flue is too small, the fireplace won't draft correctly and smoke will fill up your room - that's bad. If the flue is too big, it may not warm up enough to create a good draft and smoke will fill up your room - that's bad. Before we started our project the kitchen fireplace was 64.5" x 58.5" so the area of its opening was 3,773 square inches (feel free to check my math!). That means the flue size needed to be 377" square...but it was only 308" sq. Uh oh. The fireplace did smoke a bit when we had cooking demonstrations in years past but opening windows seemed to help somehow (besides allowing people to breathe!). The corner fireplace is 31" x 41" (1,271" sq.) so its flue needs to be 127" sq. (see how easy this is!). But its flue was 168" sq. - its too big! The point here is that if we rebuilt the flues exactly as they were, the fireplaces wouldn't work right. 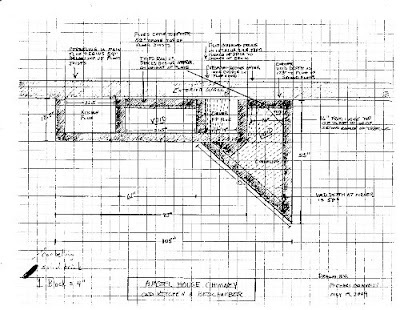 When we add the fact that we have now increased the total area of the kitchen fireplace opening (back to its original size), we definitely can't use the previous kitchen flue dimensions. The kitchen fireplace opening is now back at its original size of 88" x 58.5" (5,148" sq. ), so it needs a flue opening of 514" sq. to avoid smoking. If the original flue was just 308" sq. they must have had a smoking problem! (more on this in a second.) That might explain why the fireplace opening was reduced in size. It also might explain why a brick arch was added behind the lintle though, because of its design, it probably didn't help much. Well we have some wiggle room here. Remember that the flue for the corner fireplace is oversized. 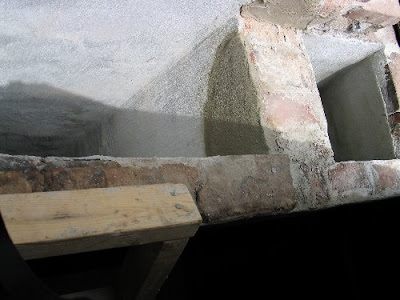 Additionally, the partition between the flues was two bricks thick. If we reduce the size of the corner fireplace flue, and make the partition one brick thick (which is normal anyway), we can make the flues upper dimension 16" x 32" resulting in a flue area of 512" sq. The result? the ability to breath in the kitchen while a fire is going! The corner fireplace flue will still work too. And the chimney will still be the same size as it was from the outside so we won't be changing its appearance. Whew! But there's a nagging question here...Why did the original mason who built the chimney make the kitchen flue undersized? Did he not know what he was doing? We don't think its likely that an incompetent mason was hired by the owner. Instead, could it be that the corner fireplace on the second floor was added after the original chimney was built? To compensate for forcing two flues into a chimney meant for one, the kitchen fireplace may have been reduced in size. 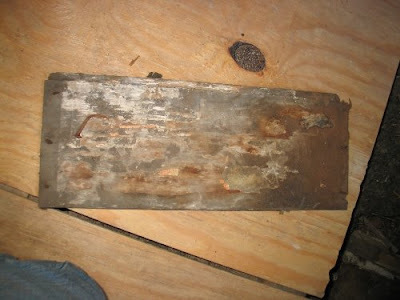 We're not sure but its something we'll continue to explore and look for evidence as we continue to work in the attic. I was not around the site much today, I had the pleasure of meeting the new director of Preservation Delaware, David Scott, and took him on a tour of Historic New Castle. In addition to visiting our sites, we toured the New Castle Court House and the Read House (BTW check out the Delaware Historical Society's Making History 11:45 blog). Michele from the Read House joined us for lunch at Jessops. We talked about preservation in New Castle and the relationship between Preservation Delaware and local organizations. I'm looking forward to working with him going forward. And that's it! Another quick blog post...but don't worry, they'll be plenty of gory project detail coming up soon! I headed up to the attic first thing in the morning to get some measurements and take a bunch of photos. I had some help from one of the masons who made some suggestions on measurements to take and took some photos from on the roof looking down at the chimney. Yeah, I know...it doesn't make any sense to me either when I see it at this size in the blog. The full size image or hard copy is much easier to read and understand. So I think its OK.
That's it for me today...more tomorrow. Today an architectural historian from the University of Delaware visited the Amstel House at our request to take a look at our weird chimney. We started out with a basic review of the house's layout in general, discussed travel patterns through the house, and spent a fair amount of time looking at the exterior brickwork and the interior back wall of the fireplace. That will be my job on the 19th. 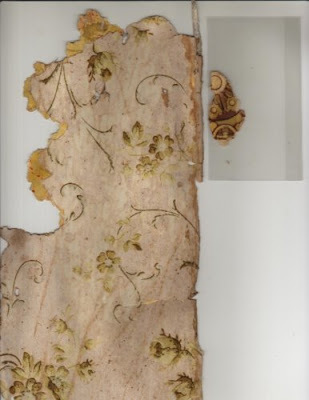 She had several questions about the patterns of movement throughout the house, particularly in the kitchen wing that we will try to shed some light on as we discover more architectural evidence during this project. She agreed that its not typical chimney construction. She suggested that we take lots of photos with tape measures in view, take detailed measurements of the chimney structure and draw plans for in cross section. She spent a fair amount of time looking at the back wall of the fireplace and in particular at an area where several brick joints seemed to line up vertically with each other. She questioned whether that part of the wall had ever been rebuilt and whether the oven may have been moved at some point. 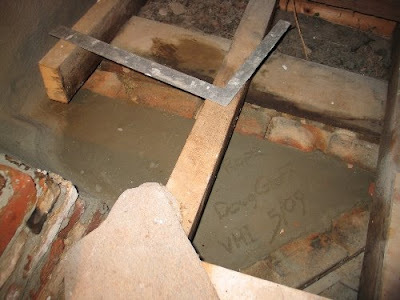 Outside, beneath the eaves on all three walls of the kitchen wing, there appears to be recent (not 18th century) work on the bricks directly beneath the roof. She asked if the roof had ever been rebuilt. Her observation of the brickwork, in combination with sawn rafters visible in the attic, and our documentation about a new roof added in the 1870s all seem to support a case for a new roof line. In addition, there is a ghost line on the rear wall of the main house that indicates that the roof line changed (this is not visible from the ground). Whitewash, Wallpaper, and Beveled Butts - Oh my! It didn't fit. It wasn't even close. It was too long to fit between these joists. But that doesn't mean that its not trim for a hatch. It fit perfectly right back where it was originally found although it was not oriented as it would have been for a hatch. Also, that would put the hatch right above a winder staircase, which doesn't seem like a very good location for attic access. We'll be removing a lot of blown in insulation and replacing it with new insulation. When we get all that old stuff out we'll get a good look at the joists, and maybe we'll find evidence of the hatch location. Fingers crossed. The shingles being in place are great because it tells us how much of each shingle was exposed. 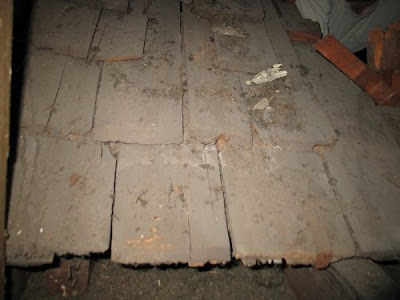 We checked up in the attic of the main block of the house, and guess what...we found more shingles that match the ones from the kitchen wing...some never used. The used ones are useful again, because its very obvious how much of the shingle was exposed to the weather. 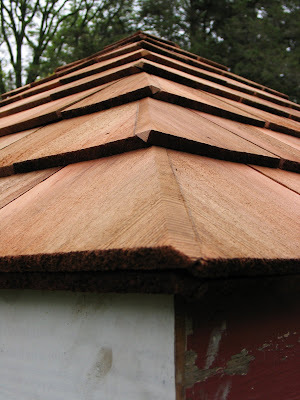 So now we have a question...we are not planning on putting bevel cut shingles on the roof. Does or should this discovery change our plans about the type of shingle to use? Discovery number 3...the rafters and joists in the attic are all sawn with the exception of three hewn joists. That's not what I expected - I thought they would all be hand hewn since the place was built in the 1730s. One of the masons reminded me that their is a ghost line on the rear wall of the main block that may indicate that the roof structure on the kitchen wing was rebuilt at some point. There also seems to be alot of newer brick work just below the cornice and rakes of the kitchen wing that indicates something major changed. Back to the attic of the main block. The timbers in the main block are also all sawn. Hmmm... 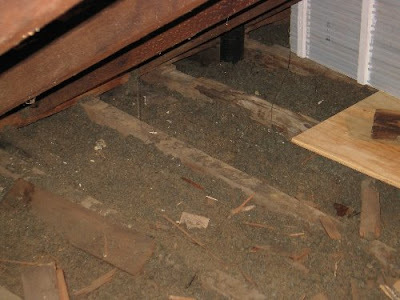 The three hewn joists in the kitchen attic all have notches cut in them that are not used in the current structure. Hmmm....Could they have been reused timbers from another structure - maybe. What does this all mean? I don't know yet. 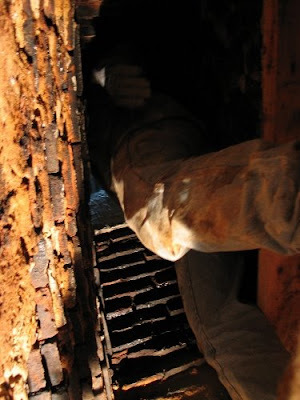 We need to fill the voids in the chimney to make it safe to use. If cracks develop in the flues and anything combustible (mice nests, shingles, etc) is in the void then the whole house can burn down. The historical society would like to use the kitchen fireplace in the future, and if the Society ever sells the Amstel House to a private owner, we want to be sure that the chimney is safe for them to use. Our plan is to fill the voids wih a lightweight, non-combustible mixture of cement and vermiculite - the mix is 50 lbs of cement to 20 lbs of vermiculite. That sounds like it's heavy on the cement, but by volume it is far more vermiculite. We are going to trim the ceiling timbers back from the side of the chimney, and use a header to support them when necessary. We are going to parge the exterior surface of the chimney (the surface that faces into the attic) for additional fire and smoke protection. 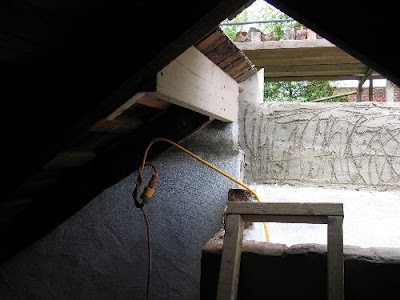 We are also going to parge the interior surface of the CMUs (cinder blocks) on the inside of the gable wall to help prevent moisture infiltration. We also decided to bring in six total sheets of plywood while we have a big hole in the roof to lay down as a floor in the attic. 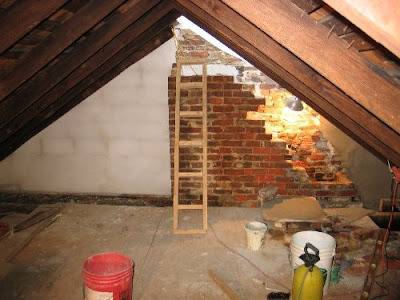 This way we can move around the attic easily for maintenance, and can store some lightweight items up there as well. 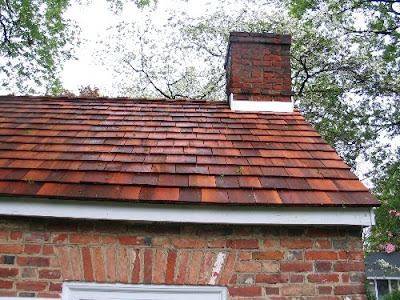 But...before we do anything more with the chimney we want to invite someone from the University of Delaware's Center for Historic Architecture and Design to visit the Amstel House and examine our chimney. We also want to fully document the chimney with photography and measurements. That's it for May 12...I'll continue with my belated updates later today or tomorrow. In addition to being historic preservation month, May is also archaeology month! And I almost forgot to put a plug in for the archaeology symposium that at the New Castle Court House on Saturday, May 9, from 9 am to 4 pm. The topic is "Early Colonial Period Archaeology of the Delaware Valley." Middle Atlantic Contact Period Archaeology as Colonial Discourse: Are There Alternatives? Wampum on the Fringe: Absence of a post-1610 Commodity in Delaware and Why. It looks like a lot of great discussions - See you there on Saturday! OK...I'm officially tired of rain. And it looks like we're in for more rain through Saturday. It's slowed us down a little bit here, although the masons are on site today. They are working on parging the main flue. Parging is the process of coating a masonry surface with mortar. 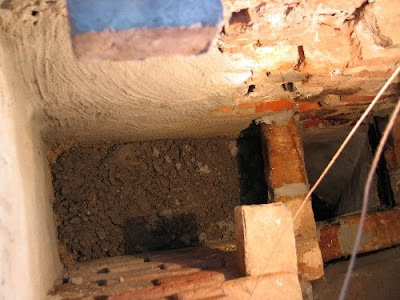 Here's an article that talks a little about parging, types of mortars and flue liners (http://www.ptvermont.org/homeowners/32chimneyflue.htm). The discussion of flue liners is good although it leaves out the important point that by installing a flue liner you are reducing the size of the flue. If your fireplace opening remains the same, you may cause the fireplace to smoke - meaning the smoke from your fire comes into your room instead of going up your chimney. So much for the enjoyment (cough!) of a cozy fire! They will complete the job from the relative comfort of the fireplace opening tomorrow. The new parging will come down to the top of the historic plaster. The historic plaster will be left in place and left exposed. 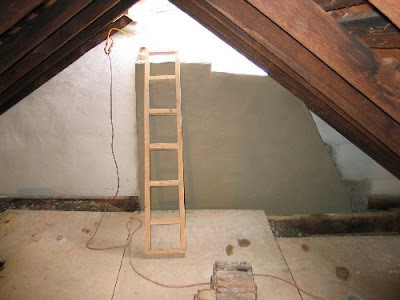 We are not planning to fill in missing areas of plaster that is visible in the fireplace opening. They will also parge the flue for the second floor fireplace too. Even though there are no current plans to use the second floor fireplace, while the chimney is open we want to do as much as we can to improve the condition of the flue in case a decision is made to use it in the future. If that happens the rest of the flue can be easily parged from the top of the chimney down and from the fireplace up to complete the job. In the meantime, I was planning to go get some more bricks today but that's not happening - I don't want to climb around on a pile of wet bricks to find the ones I need. I'm not coordinated enough to keep from falling on my head. So maybe when the rain stops...uh, how about Sunday? No - that's Mother's Day and I'll get in big trouble with Mom...Monday then. It's been raining a lot lately so our construction activities have been limited. We do have two new new roofs (yes, two "new"s) that have corrected some issues with the first new roofs we added to our outbuildings (see my previous post), but that's about it. Just because it rained today doesn't mean that there's no historic preservation news in New Castle though. This afternoon Senator Tom Carper arranged a town meeting in New Castle to discuss the national historical park proposed for Delaware. In addition to Senator Carper and Congressman Mike Castle, Secretary of the Interior Ken Salazar and the Deputy Secretary Tom Strickland were both in attendance as well! It's not often that a member of the President's cabinet makes an appearance in New Castle so this was big! The meeting was very positive with both the Secretary and Deputy Secretary pledging to champion the cause of establishing a national park in Delaware (the only state that does not have one). The audience in attendance (about 100 people) were all very positive about the park as well with public comments in support of the park proposal being voiced by the Mayor of New Castle, the Delaware State Historic Preservation Officer (Tim Slavin), and several others. The Secretary of the Interior also received a copy of the New Castle City Council's resolution in support of establishing a visitor service center in Historic New Castle. Not a single comment against the national park was voiced. Excellent! If the park is established under the current proposal, the Historical Society will be partnering with the National Park Service to interpret New Castle's history. Secretary Salazar mentioned that the park format might resemble the model used in New Bedford, MA. Another possible model may be the Boston National Historical Park. Whatever form it finally takes, we're looking forward to working with the Park Service as a partner. Hopefully, we'll return to our regularly scheduled construction discussions tomorrow.